Welcome to our Trips and Travel page. You DO NOT need to travel alone. If you are interested in traveling with a great group of people, join in the fun with HIP Travel. Each trip is an adventure! Our travel program is open to anyone over the age of 18, however, there are member and non-member fees . Members of the Hartland Senior Center receive discounts on travel fees. 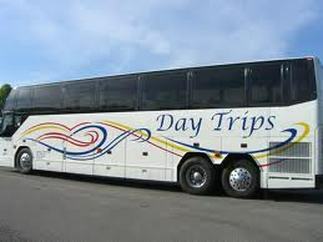 Both day and night trips are available. All bus trips are driven by professional drivers. All of our trips will be picked up and dropped off at the west end of Hartland's Target parking lot. -Travelers are responsible for finding their own roommates. -To avoid disappointments please make reservations early. -All trips are on a first-come first serve basis. -All day and short overnight trips require full payment at the time of registration. -Many extended trips require designated deposits at the time of registration. -Refunds are done on an individual basis depending on pre-payment of tickets/transportation and are subject to cancellation fees. Due to trip requirements some trip costs will not be refunded unless someone can be found to take your place.-When signing up for a casino trip, please provide your players club card number, address, telephone number, and birthdate. Each casino is requiring this information for their manifests. * Please do not ask our staff to put your name on our trip list without payment. If you are interested in a trip we will make a note of your interest but that does not guarantee you a spot on the trip. We use those lists to call people to remind them of their interest if the trip is filling up.